Arguably one of the leading bands in the New American Metal charge, the Massachusetts-based clan Shadows Fall has returned, after spending what seemed like an eternity on the road, with the 10-track The War Within. The endeavor is a blistering indication that these guys are a force to be reckoned with, as all of the metal devices necessary to drive a band to the top of its game are show up here in one form or another. 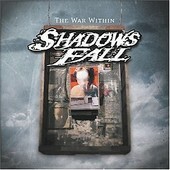 From the guiding anthemic choruses of "What Drives the Weak" and "The Power of I and I" to the tour-de-force drumming and jaw-dropping guitar work heard throughout the entire album, Shadows Fall firmly makes one thing clear: metal is not only alive and well, but thriving, thanks to bands like themselves who meld the intensity of today's sounds with the intricacies of virtuosos. The only complaint about The War Within would be the relentless assault rendered by the band, not leaving the listener a moment's rest throughout the entire 42-minute affair. The future of metal is here, and Shadows Fall is at the head of the class.